Product Size 6" measured with arc of ball. Imprint Area 2" W X 1 1/4" H.
Stock Stripes $0.15 per piece (Please indicated choice in "Stock Stripe" drop down menu above.) option available on customized footballs only. Not available for rush production. Setup Charge $20.00 per ink color. FREE set-up on Side-2 if artwork is same as Side-1. Would recommend 100%! Loved the footballs - great quality and exactly as ordered. Not only were we very pleased with the product, but also the customer service. The representative was not only very helpful, but very patient as well. Our order got a little complicated, but she helped us through every step. The order was a rush and it actually came in earlier then expected. Would highly recommend this company and their products!! We had to rush this order as the stadium name unveiling approached quickly. Promotion Choice did an excellent job with the footballs and our logo. However, my samples came after a delay and the website notified me of shipment AFTER I already received the balls. Thanks for the quick turnaround on the footballs! They were great, and I especially appreciate the personal touch your business gives to each customer! 5 Stars! This company had great communication with me. And the quality of the footballs and printing is good. The print area is small. Not much space to put all company's information. Really like the footballs we purchased. They were a big hit at our football game. The printing was fantastic. Plan on ordering more for next year. This company was fast and so helpful to get us the right logo and color for our HOCO parade. Yes use this company ask for Jen. She's the Best!! The representative that work was very helpful and I love the product. Would use again. Thanks. Got our product fast! No problems with art work. Would use again. The representative that worked on my footballs was great. The product was completed and shipped very quickly. Would definitely purchase again. 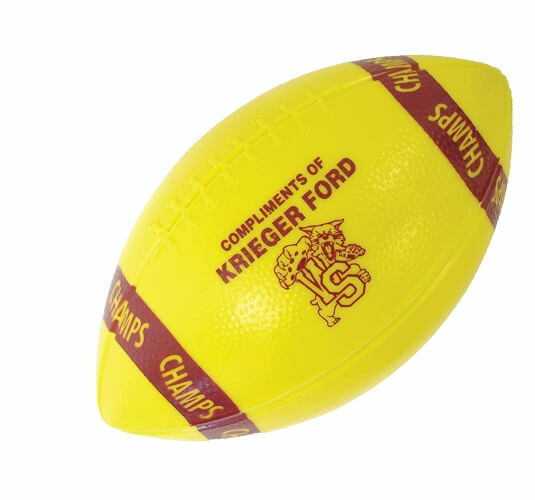 Regarding our order for the mini footballs, we were very pleased with the entire transaction. The service was great, we are pleased with the product, and everything went smoothly. Ordered these for a football event we were hosting at our church. Promotion Choice did a great job fulfilling our order and got it shipped to us before our deadline. We ordered the white ball with a solid stripe and our logo in a navy blue- looks fantastic. Good Job guys, thank you! The footballs arrived yesterday. They look terrific and everyone is thrilled with them. I would like to thank you again for taking the time to help our football team and do such a great job. Please forward this to your supervisor because I would like them to know what an asset you are to the company. Great Turnaround and Great Footballs! Thank you so much for having the footballs ready on such short notice. They turned out Great!!!! I have told several people about promotionchoice.com and how great a company you are. I will use you again hopefully soon. I wanted to let you know that we received our football today and absolutely love them!! Thank you so much for all of your help and such an awesome job. HEY! GOT THE FOOTBALLS…THEY ARE AWESOME!!! THERE IS A FAN IN THERE FOR ADVERTISMENT…IS THERE ENOUGH TIME TO GET THOSE PRINTED AND HERE… BALLOONS ARE HERE TOO…THEY ARE PERFECT.